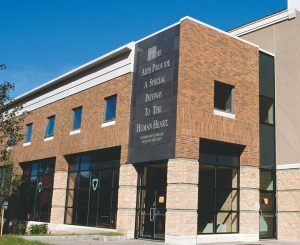 Begun in 1983 by Professor John Meredith Hill, the University Reading Series brings distinguished writers of poetry, fiction, non-fiction, and drama to campus each year to give free public readings of their work to the greater Scranton community and to meet with, instruct, and inspire students and faculty in the Department of English and Theatre. Guest readers have included: Anne Pierson Wiese (Floating City Poems), Catie Rosemurgy (The Stranger Maual), David Wyatt (The Year America Turned), Ada Limón (Bright Dead Things, Sharks in the Rivers, This Big Fake World: A Story in Verse, Lucky Wreck), Allison Joseph (Voices: Poems, My Father’s Kite, Worldly Pleasures, Imitation of Life, Soul Train), Matthew Hobson (The Audubon Guide to North American Suicides), Brianna Noll (The Price of Scarlet), and Martha Serpas (The Diener, The Dirty Side of the Storm). 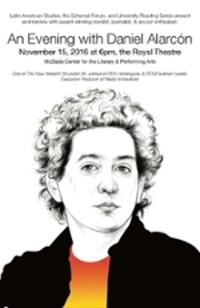 For more information, please email Joe Kraus or Billie Tadros, Department of English & Theatre. 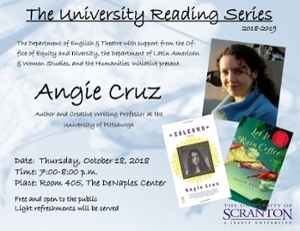 Author and Creative Writing Professor at the University of Pittsburgh will be reading from her latest works on October 18, 2018 in the DeNaples Center, room 405, from 7:00 – 8:00pm, all are welcome. 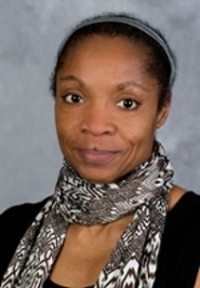 She is an American novelist and the author of Let It Rain Coffee and Soledad and is currently working on a screenplay for one of them. Thanks to the support of the Office of Equity and Diversity, the Department of Latin-American & Women Studies, and the Humanities Initiative for helping us make this a possiblity. 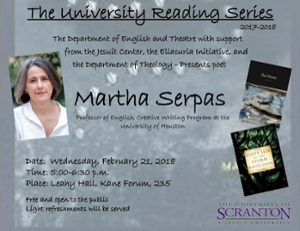 Professor of English at the University of Houston, Creative Writing, poet and author of The Diener, The Dirty Side of the Storm and Cote Blanche will be reading from her latest works on Wednesday, February 21, 2018 in Leahy Hall, Kane Forum, room 235 from 5:00 – 6:30pm, all are welcome. This is made possible with support from the Jesuit Center, the Ellacuria Initiative and the Department of Theology. 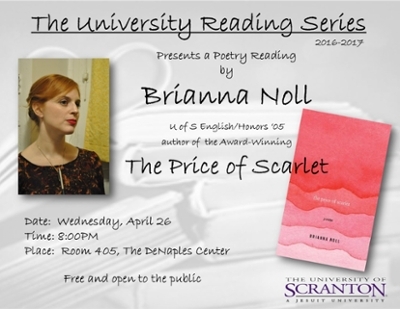 We’re proud to boast about alum Brianna Noll (English, 2004) whose new book of poetry, The Price of Scarlet, (University of Kentucky Press) is winning attention and praise. 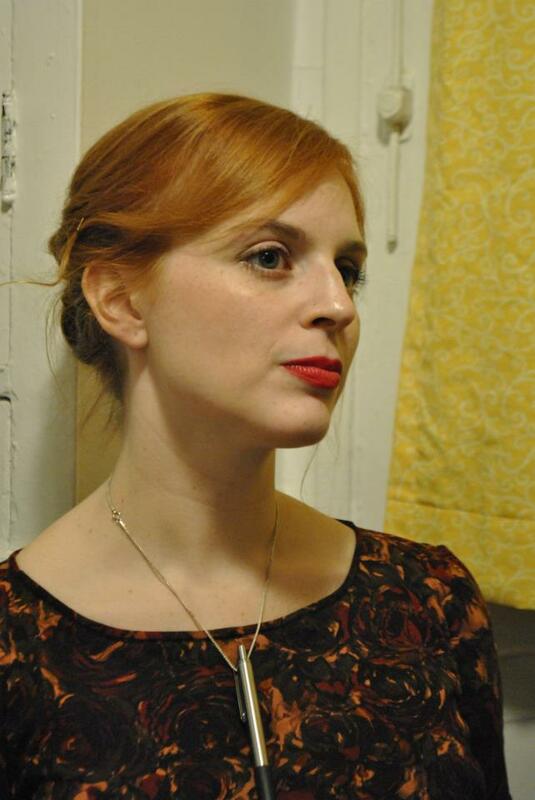 Her vivid poems obscure the line between what is literal and what is figurative. 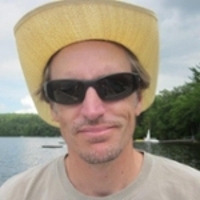 The result is alchemic and ethereal — each verse intricately layered with sharp observation as well as emotional and intellectual exploration and questioning.